Wow, beauty and low cost in a gymnastic trophy. The Acrylic Ice Awards offer you style and savings. Choose from 3 styles and two or three size options all at budget prices, starting at $3.85 for the smallest of the Block Ice Gymnastics Trophies. You"ll love the Flame Ice Gymnastics Trophies with a 4 inch and 5 inch options. 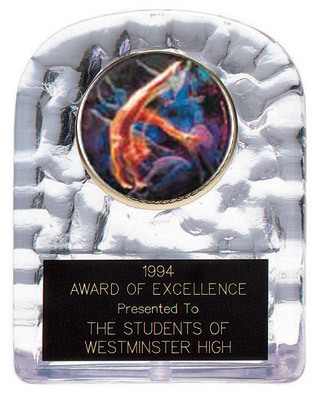 The tallest Acrylic Ice Awards are the Star Ice Gymnastics Trophies, with the largest being 6 inches tall. We have both male and female gymnastics inserts and other gymnastics mylars. 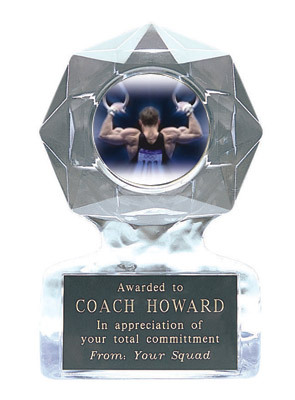 Not only are the Acrylic Gymnastics Awards priced low but, they also come with 40 characters of free engraving. 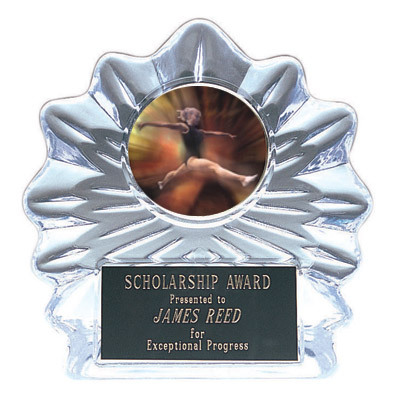 Click on one of the Gymnastics Ice Trophies below for more information and to make a purchase. We?ll be happy to assist you if you need us call 1-800-787-8777. Business hours are Monday - Friday, 8:30 to 4:00 central time zones.